Jerry Pinkney and Aidan | What is ML Reading? Jerry Pinkney has illustrated over 100 book since the 1960s. I haven’t read them all, but I’m working on it. He received the 2010 Caldecott Award for The Lion & the Mouse. He’s also received the Caldecott Honor five times for Noah’s Ark, Mirandy and Brother Wind, The Talking Eggs: A Folktale from the American South, The Ugly Ducking and John Henry. The only illustrator to win more Caldecott Honors is Maurice Sendak of Where the Wild Things Are fame. 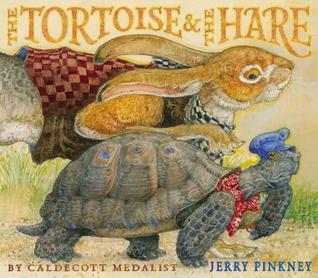 Jerry Pinkney’s most recent book The Tortoise and the Hare is my top choice for the Caldecott. I know I keep naming books I want to win the 2014 award. After reading this book with ML, my vote is decided. She was mesmerized. Mr. Pinkney set his version of the Tortoise and the Hare in the Southwest desert. His biggest challenge was making the characters pop off the page where survival depends on camouflage. The solution – dress the animals in clothes. But not too many clothes. The hare wears a vest and the tortoise dons a hat and bandanna. Other animal’s clothes include top hats, bowlers and bonnets All the clothes were popular in the past. The result – a timeless feel just like the story itself. While researching for this post, I learned that Jerry Pinkney suffered reading difficulties. Most likely dyslexia. You can read about his experience on the Learning Differences portion of his website. Soon after, my friend wrote a piece featured in the New York Times titled Children With Learning Disabilities Don’t Need More Opportunity to Fail about her son’s struggle with dyslexia. I know Liisa won’t mind me highlighting her advice to parents because I asked her. Luckily for Jerry Pinkney standardized tests weren’t a part of his childhood. Thankfully for Aidan, his parents have the resources to hire specialized tutors. Even more important, Aidan’s parents encourage him to focus on his strengths. I’m certain Jerry Pinkney had someone doing the same for him. This entry was posted in Picture Book and tagged Jerry Pinkney, The Tortoise and the Hare by mlreads. Bookmark the permalink. I love, love, love that book too.